Ask the Readers: How to Retire Early? Though many readers of this site have modest financial goals, others are more ambitious. Many want to get rich. (That's not surprising; after all, this blog is called Get Rich Slowly.) But I think most GRS readers are aiming at something in between. My husband is 30 and I'm 28. Our main personal finance goal is to retire early or become financially independent, so that we have freedom to choose what to do with our time. We understand that to achieve independence, you need to generate passive income that exceeds your expenses. What's the best way to do that? We're putting aside 10% and 17% into our 401(k)s, respectively, but if you can't withdraw from your retirement accounts until age 59 1/2, how do you bridge the gap if, let's say, you want to retire at age 52? We know we're a long way from financial independence, but we want to start planning how to get there. We've covered the basics of personal finance (emergency fund, no credit card debt, spend less than you earn, fund retirement). Now what? When people ask me about early retirement, I mention two books. A chart from the book. To learn more, buy a copy (or borrow one from your library). The Crossover Point provides us with our final definition of Financial Independence. At the Crossover Point, where monthly investment income crosses above monthly expenses, you will be financially independent in the traditional sense of that term. You will have a safe, steady income for life from a source other than a job. 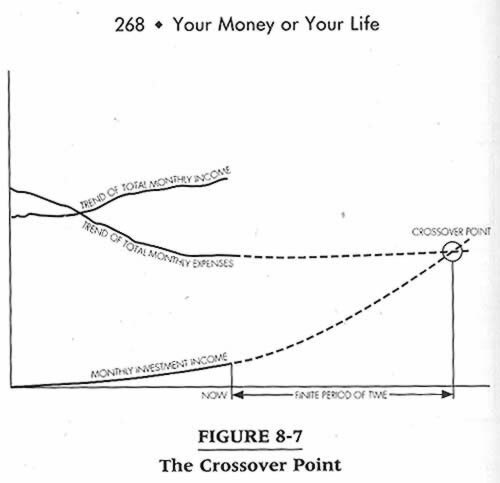 Reaching the Crossover Point means that, if you wanted, you could stop working for money. For most people, this never occurs. The second book I recommend is the lesser-known (but just as excellent) Work Less, Live More by Bob Clyatt. Clyatt encourages readers to reconsider traditional notions of retirement and early retirement, and to instead focus on what he calls “semi-retirement”. Note: Because I sold this blog, I'm fortunate to actually be in a position of semi-retirement already. My nest egg isn't large enough to allow me to do nothing — nor would I want that — but I do have the liberty pursue activities that I enjoy or that are meaningful to me. (Often, they're the same.) That I'm able to earn a living doing these things is a bonus, and allows me to avoid tapping my savings. But let's get back to Charlotte's question. What's the best way for her to achieve to financial independence? Or early retirement? Or semi-retirement? As you can probably guess, the answer is the same as for getting out of debt or saving for a down payment or pursuing any other sort of large financial goal. That is, Charlotte should focus on earning, spending, and saving. Spending is the other side of the basic personal finance equation. While you want to boost your income as high as possible, you want to cut your spending as much as you can. Last year, I described how I spend my money, explaining the steps I take to keep costs low. The less you spend, the less you need to earn to support your lifestyle, and the more you can save for future goals — like early retirement. Saving is the final piece of the puzzle. Or, more precisely, investing. Once you've subtracted your expenses from your earnings, you're left with savings. Investing is what you do with these savings. Stupid investing can set you back years; smart investing can give you a jump-start on your goals. When I described how I invest last year, I emphasized savings accounts for short-term needs and index funds for my long-term investments. That's still my plan. Charlotte and her husband have been doing things. They need to continue doing them, and to do more of them. Because they're in what I call the “third stage of personal finance“, they need to practice patience. In time, they'll reach their goal. For now, they just need to keep being smart with money. Note: At the same time, Charlotte should be sure she has room in her budget for fun. If she's doing all the right things but not enjoying life, she's going to be less inclined to continue making these choices. It's important to budget for the fun stuff too. All of this is Big Picture stuff, though. It's the road map that Charlotte (or anyone) can use while marching toward early retirement — or other financial goals. I get the impression that she'd actually like the GRS readers to give her some feedback on the details of achieving this dream. What do you think? What's the best way for Charlotte to reach financial independence? It'd be great to hear from folks who have actually managed this, but I also think it would be helpful to hear from those who have this as a goal. What steps are you taking? What investments have you made? How do you keep your costs down? How do you keep from getting bored during the years and years of waiting? There are 124 reader responses to "Ask the Readers: How to Retire Early?". You can withdraw from your 401(k) early. Rule 72(t) allows withdraws without the 10% penalty. That’s true… FOR NOW. Judging how broke the federal government is, it is pretty reasonable to assume they are going to be raising taxes and generally getting iron fisted about retirement accounts, if not outright stealing them. For that reason, I’d be very leery of putting a lot of eggs in the 401k basket. The rules of the game will change over the next 10-30 years – bet on it! I’m so tired of these “the government is gonna raid our retirement accounts” conspiracy theorists. My brother was spewing this nonsense and I asked him how he knew. Someone at work told him a bill had already been passed. I said tell that person to show you the evidence and bring it back to me. He has yet to do so. If someone has hard-core evidence that this is actually going to happen, share it. If not, stop with the fear mongering. Chip, I agree with you 100%. Read this article on the fallacies of the 401k. There is something called Series of Substantially Equal Periodic Payments. You can access qualified money (IRA, 401k, etc) before 59 1/2 without penalty. Not saying I’d recommend this, but it’s an option. If you’re disabled you can touch qualified money before 59 1/2 and avoid the 10% early withdrawal penalty as well. An option I like is the Roth IRA. You can take your CONTRIBUTIONS (not gains) from a Roth IRA without penalty as well. So if you max out Roth IRAs ($10k total for you and your spouse) over the next 20 years, that would be at least $200k that would help get you to age 59 1/2. Actually you can withdraw without penalty from your 401K before 59 and a half, by taking scheduled withdrawals based on your age. The amounts will be about the same every year and have to be taken every year once you start. I think Jennifer’s point is the single most important and ignored piece of the puzzle. These are called 82(t) withdrawls, and are a huge piece of how I plan to retire in my early 50’s. This is great to know, but it’s begs the question: How do you square this plan with the conventional wisdom to withdraw a fixed PERCENTAGE of your nest-egg in retirement (as opposed to a fixed AMOUNT)? I have learned alot about this subject over the years, especially recently. I have a unique situation, I think: I have a lawn care business, a small web design business then over the past 3 years have begun to accumulate apartment buildings in my area for 20-30k per unit after renovations. This combination allows me to work in a variety of environments, and NOT have my income tied directly to my day to day action. I might run around like the proverbial chicken with head cutoff for a day or two, but then we can go weeks without doing much of anything, especialy with the apartment buildings. What I love about the apartment business is that as time goes by, and I age, I can “offload” more and more of the day to day management. Yes, there is a cost, but we factor that in now. We set aside 10% of the gross earnings which is what mgmt. may cost, so that we learn to live without that 10% now. I love the business also, becuase I get paid for what I DO, and I also get paid a return on my invested capital. third, although I say I get paid for what I do, it’s really a high hourly rate when I add up how much time it really takes to manage 40-50 apartments with a good system. Todd Tressidor at http://financialmentor.com/ talks alot about having a “3 prong” approach which includes paper assets (stocks, bonds, etc. ), a business, and real estate. The 3 really do work well together. What I love about the other businesses I own are that I don’t have to be locked into one activity. I’d die of boredom if I had to paint and fix toilets. So I outsource that for $10-$25 per hour and make $50 per hour building a website or mowing lawns. Or I can outsource THOSE things and practice music or writing. This is really about “diversification.” I just read an article recently on this blog about just that. Instead of “portfolio” diversification, it’s “income diversification.” Good Stuff. In terms of “early retirment” my scenario will allow me to sort of do this in stages. As my mortgages are paid off, my income will jump by $400 to $1,300 per month as each one is laid to rest. My choices expand each time that happens. Keep the lawn care business, sell or outsource the web? Sell the apartments or take cash outs and start over? I love having a few (but not TOO many) choices. On the other hand, we eat almost 100% organic or fresh produce, and our food bill is around $100 per week or more for a family of 3. We don’t eat out more than 1x per month, and almost NONE of our clothing is bought new (my wife would kill me if she knew I said that online!!) Our health insurance is expensive, but we stay health. We dont’ have soda or candy in the house at all, and eat zero processed foods. We wake up, enjoy life, work, rest, read, excercise, etc. I think this is key. After a while, you just get used to less. It’s not that you get used to a “lesser life” it’s just that your body, mind and spirit learn to be OK without alot of junk. And that’s what it is, really. I mean, multi millionaires 50 years ago didn’t have HALF the comfort middle class people of today have. thumbs up to everything ken said. my husband & i retired in our 40s. i was 42. 1 – we owned our own business. 3 – we lived without debt. 4 – we funded our retirement early, then began building non-retirement investments. when we retired we had multiple small streams of income – investments, real estate (which people advise against but has been great for us, as ken describes), and a small hobby business. retirement to us is not sitting around on a yacht or hanging out at the country club. we spend time with our family, enjoy the same simple pleasures we always have, and we have many interests (some of which end up bringing in a little extra money). we love to learn, and we love to work hard at things that interest us. being financially independent means we can do what we want to do. it means choice and freedom. as an extra bonus, we are really healthy because we have plenty of time to exercise, garden, and eat right. and being financially independent really lowers your stress. the biggest mistake i see friends making re: planning their retirement is overestimating how much money they’ll need and what kind of lifestyle they’ll “need”. they have a mindset that they’re slaving away for 40 years so they deserve to retire like royalty. meanwhile we are already living the sweet life with friends, family, health, interesting projects, etc. and – it is absolutely possible to retire early with kids! you just don’t live that “gotta have it all” lifestyle. the biggest mistake i see friends making re: building wealth is figuring out what a “need” is vs. what a “want” is. they think their kids *need* a disney vacation every other year. they think they *need* a new car. they piddle away their money and then complain that they have nothing in the bank. when we were in our late 20s/early 30s, our friends were buying new cars and taking expensive vacations. now they’re worried about losing their jobs and we’re retired. This is what I was going to say also – think about investing in rental real estate. But make sure that you have a buffer, so that when a unit is unrented or the tenant is late with the rent, that you can still pay the mortgage. It can be a pain in the behind to be a landlord, and I was glad to sell our rental property a number of years ago. However, it was a great source of cash flow (and the depreciation is a nice tax deduction). And I’ve frequently considered going back into it. Good advice Ken(s) and Laura. I agree with #48’s 401(k) response to #1 and the fact that so many people lost a lot of their 401k retirement value due to not having full control of how the “expert” money managers poorly managed it. I never met a millionaire that saved his way to a fortune. Therefore, I agree with those that advocate investing in real estate and not keeping up with the Jones. Over the years, I first paid off my mortgage. Then I lost lots of money in the stock market. I began to buy rental homes and today own three. With a 401k you have to worry about inflation eating at it and also running out of money before you die. My passive income is practically perpetual and as inflation goes up so does the monthly rent. When I die, I will give my kid real estate know-how and a tool that has more value than when I started. I reinvest all profit into more homes while the Jones are currently buying the luxury car. My advantage & hobby is that I love to fix things. Fixing the car and repairing 98% of what breaks in my rentals. The more I learn the more I save. Find friends that have the same goals as you do and mentor each other. Read “The Millionaire Next Door”. Don’t invest in stocks as brokers are not looking out for your interests. Our lawmakers own lots of real estate and will not pass taxing-laws detrimental to themselves. I’m almost 52 and will be ready to retire in the next couple of years. Ken, is right about the freedom Real Estate and several different income streams brings in your life. I’m turning 40 next week and have been financial independent since Jan. 2011. I graduated in 1990 and attended a vocational shool for business in 1991. In june 1991 I started laying brick and set a goal that by the time my kids were in high school I would have enough income from investment properties to semi-retire. We now own an Auction company, Are part owners of a Funiture store and Own 40 rental units, O Ya we also have our license to sell Real Estate. All this was done on a small wage of between 18,000 a year at the low to 35,000 a year at the highest wage as a brick layer. We now have payed off enough debt and have enough income from our Rentals and other incomes that we do not have to do a thing if we chose not to. I personnelly think that Real Estate is the great equalizer that allows low income people to build a side income that will quickly replace their current income. Now, we make what to us is a huge income, but have not changed our life style and are working very aggressivily toward being Totally Debt free. Since we never made that much we have always saved Half what we made no matter what we made. Now we do what we enjoy and have the peace to know that we will always have enough. The next goal for us is to Invest in NNN properties that have very little managment need. We want to move in that direction for more income streams. It always amazes me that everone thinks you need a big income to ever become rich. I think it is easier for a low income person to become rich, because rich to them is a whole lot less then what it would take for a person who makes 100,000 or more to feel like they are rich. They are already there, but do not manage there money like a poor person. We are going to love the freedom of not having no debt, but have tons of money to keep building our passive income. A couple of thoughts on how to support yourself before reaching the age of 59 1/2. Does one of your employers offer a 457 (usually a government related agency)? My understanding is that this would allow you to start withdrawing money once you officially retire. I think you can do this by 55 at the latest, and quite possibly earlier. Another option is to have rental income. I owned a duplex (lived in one and rented out the other half). When I moved, I kept it with the idea of having both sides’ rent pay the bills until that mortgage was paid off, at which point it would just be income. I’m in the process of selling that place because of the costs and stress, but that doesn’t mean all rentals are a bad idea. In fact, where we live has a basement apartment that we rent out. So even when our mortgage is paid off, we’ll still have a good chunk of change coming in every month, regardless of our employment status. oooh… he’s jacob-from-ere’s “anointed” successor, yes? i should check him out. thanks! What’s so special here to get 20 likes? Charlotte, If its your main goal to retire early, than my recommendation is to do more than the 10% aside and 17% in retirement. I’m single and don’t yet have a family (I know that gets expensive) but I saved 50% of my take home pay in 2011 and am on track for close to 60% this year. If you think about it in terms of percentage, each year that you save half of your income, you buy yourself an entire year of independence. This, along with investing that savings can lead to a pile of assets in just a few years. I am striving for this too and the way I am thinking about it is to cut my expenses to the bare bones, which is now less than half of my income, and save as much as possible, as fast as possible. I understand that I may get burnt out, but I just keep doing what I can, for as long as I can. I became debt free less than a year and a half ago and already, I have almost 2 years of living expenses in the bank. I’m saving toward buying a house in cash at around 3 years from now. 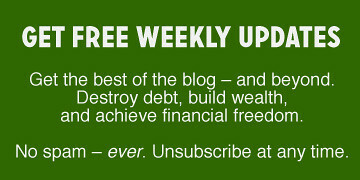 I think this is a step that will help me achieve financial independence early. My goal is to have FI by 45 or so. That’s in 17 years. Good luck to you and your husband! You can do it! Do you track your savings/income ratio considering your income pre or after taxes? I track it with my pre taxes income, but I’d like to know how people do it. I always track pre-tax / gross income because otherwise it just gets complicated given that some savings (401K, traditional IRA) are pretax and others are post tax (Roth IRA, Roth 401K). I try to save 30%-35% of my gross income… sometimes I come pretty close, sometimes I fall short. I’m surprised how some people can save this big amounts of their income. In 2011 I did a around 20-25% of my pre taxes income. Probably there is a big difference in income, because I can’t imagine my self saving 35%or even 50%. Without knowing their incomes (and I am not asking) the 10% and 17% remark doesn’t tell us anything. If she makes $170k/yr then 10% is all she is allowed to contribute. I was going to make the same comment as Kraig, that they likely need to save more. 10-17% of your income generally won’t set you up to retire early. For example if you make $50k now and save 14% of it then in 20 years that is only about enough to replace ~20% of your salary after inflation and growth. Over 35 years that savings rate would give a next egg large enough to replace 40%+ of your income. I you have very large incomes and modest spending then saving 10-17% may work out. For example if you make $250k and only spend $50k then saving 10-17% would set you up for early retirement. We have always been frugal for the most part but have learned a lot over time. Now, we only go to the movies once or twice a year and it will be a matinee. Netflix takes the place of daily tv and movies for us. We share a Starbucks coffee at the most once a month. Otherwise, we’ve learned to make at home what we like. I do like to be warm so if I waste money that is probably where it goes. Use to love to eat out at expensive places and we still do from time to time but last Sunday we had waffles w/ strawberries and like eating at home because then we have more time to read our many library books. We are at a place in life where we know what we like. What we want to keep. As things leave the house it is easier to keep clean and cook in the kitchen. Lack of clutter really helps. Also, write down your goals, and check in on them every quarter. Does anyone have any experience with dividend paying stocks? I recently picked up Derek Foster’s “Stop Working” and “Stop Working Too” and I think that’s a big part of his strategy. (I haven’t delved into the books much yet, but he reached financial freedom at age 34). I invest primarily in dividend paying stocks. I’d recommend starting with Motley Fool and maybe checking out its income newsletter; and seeking alpha has an income investing tab with a few good contributors. Elizabeth, it really depends on your expenses as shown in the chart. If your expenses are only $1000 a month and you can get a return on your money of 3% (dividend stocks, bonds, etc.) you can retire with only $400,000 invested (1000 * 12 / 0.03). Taking an average wage of $50k and saving a 1/3rd of your gross income (16.5k) you reach this goal in about 25 years. So between 45 and 50 and this is without compound interest, raises, bonuses, side businesses, working spouse, etc. :) The point is anyone can retire early, it is just easier with additional income ($100k income would reach the goal in 13 years, $200k would reach the goal in just over 6 years!). Good point — if only the math was that simple though :) When you’re single, it isn’t just a numbers game. Couples have more pieces of their life in place — they’ve already found each other, they have an idea of if/when kids will be in the picture and they have some idea of their shared long-term goals. I think you’ve got a “grass is greener on the other side” thing going on. If a couple gets divorced, it’s generally financial suicide for your average Joe. Also, couples might have kids figured out, but kids cost a whole lot of money. And while being married can help your tax situation (the US), it can also harm it depending on your incomes. Also, single people can generally pick up and relocate much more easily for a better job than couples. @Amanda – I can see why you might think that. :) But having seen a few friends go through divorce or deal with unexpected health issues, I know life has a way of smacking us upside the head regardless of our marital status. My goal has always been to be financially self-sufficent — married people don’t always stay that way, after all. You forget about the tax man, who will only be taking a bigger bite going forward, and inflation, which is also likely to be headed significantly higher. Yeah, the math seems so nice, but what happened to the value of most peoples paper investments in the last few years? Some elderly people are having to go back to work again. The foundation of this idea is not solid. If you really want to get out early, increase the savings and debt repayment (mortgage) to at least 50% of net income. That way you should end up debt free and a big investment portfolio to fund your early retirement. While paying down your mortgage learn more about investing and tax planning. Don’t invest if you don’t know what your doing, pay down the mortgage instead. You will have time then to learn. Also JD makes an excellent point. During all of this keep in mind what makes you happy. Question all assumptions about your life (do I need this or like that?) and be fearless in living your own life regardless of what others think. There is no point getting there early if you enjoy the trip as well as where you end up. I think this really depends on what you do for a living and what you do for side businesses and what your perspective of “retirement” really is. Obviously regardless of what you do you have to put in the hours and effort. Too many folks want to earn income from blogging, or real estate, or even moving ahead in their career, etc. but don’t put the real time in learning about what they’re doing and making it really work for them. While I’ve got no problem with any of those options for increasing income, I think since there are two of you one of the biggest things you could do is simply learn to live with one salary and bank the other. If you really do that, say saving $25K a year outside of retirement funds, than 20 years down the road or so you could easily have $500K to draw from (assuming it matched inflation) and bridge the gap. This obviously works better if you have higher incomes, but since you didn’t include that information you would have to decide if this is something that could work for you. Best part is you could still be increasing income in a variety of methods even as you’re doing this. Did anyone mention healthcare? If you want to retire in your early 50s, you still have a good… 15 years before you are eligible for Medicare. Unless the healthcare landscape changes drastically in this country, being a 50-year-old without employer-sponsored health insurance can be a very expensive proposition. Even if you can buy health insurance, it’s likely to be more expensive and less comprehensive than plans offered by large companies. I’d be interested in hearing how people have navigated that part of early retirement. Perhaps by picking up a part-time job that offers coverage? Just a hunch, but I have the feeling that many people who are planning on retiring early have conveniently forgotten about this little problem. I have a good friend, aged 55 and living in New York City, who is semi-retired and relies on freelance income to pay the $1200 monthly tab a (not very good) health insurance policy is costing her. Nope, have not forgotten about this. In fact, this is one of the reasons I’m worried about bridging the gap. I have a friend who was laid off 3 years before she could qualify for Medicare. She has been under-employed since then and can barely afford the $900/mo health insurance. If both my husband and I were to retire today, that would be $1800/month in health care costs, which is more than our mortgage! I’m worried how much it will cost in 25 years. Retired last November at the age of 49. Was a law enforcement officer so had a 25 year defined denefit retirement plan with the state that now sends me a check every month. We have no debt except for the mortgage, paying extra on that and have been saving and investing in index funds most of my life. My wife still works full time and makes more that I did but she loves her job and does not want quit. Her retirement is a 401(k) at her work. We also have two Roth IRA’s. By January I was bored out of my mind and started driving a school bus for the local school district. This gives me health insurance, went on my wife’s when I retired at $250 a month, now less that $100 a month. The hours are great for me and when school is out, I am off to fish. It all comes down to living within our means, not having debt and PLANNING before doing. And guess what? We do what we want and are enjoying life. Good luck to all. I agree and I’m interested to hear more about this topic. Things could may change with the ACA (Obamacare) or something else that reduces how fractured our healthcare system is…but I don’t think anyone know what’s really going to happen. Yes Obamacare should impact this some. One provision going into effect in 2014 is that it limits the price difference you can have based on age for individual plans, small group plans or the exchanges. The maximum price difference for age alone is 1 to 3. In other words the most that an older person can pay is 3x what a young person pays based on just age. I don’t know how the real numbers would work out but this is just an example : Today a 20 year old may pay $200 and a 60 year old pay $900. Thats a 1 to 4.5 ratio. With a 1 to 3 ratio cap it would be more like $275 for the 20 year old and $825 for the 60 year old. Plus they also don’t allow prices to vary based on health status so that would help the older buyers more as well. We are sort of in the same place as Charlotte. We are focusing on cutting our expenses as much as we can. I don’t mean just by cutting cable (though that is certainly the first step) but we would like to eventually move to a place that allows us to use alternative heat and energy sources (solar, wind, wood etc.) to get our costs even lower. We had a garden last year as a bit of a test project and plan to expand on that quite a bit this year. We would even like to get chickens next year if we can. On the other hand we are working at increasing income by finding some different income streams- some of them are passive and some of them just involve working for ourselves so we have more control. We set aside the money from some of our side gigs to re-invest and that has been great. Now when we see money making opportunities that need a bit of start up money we have it (it’s not a lot- just for little opportunities now). Eventually we would like to get into real estate and semi-retire doing that… We just need to save up enough to buy a second home and then we’ll go that route. Just an FYI, backyard chickens don’t save money. We have 6 and they provide amazingly great-tasting and healthy eggs (I drink them raw). The chickens are fun to watch and play with, and our children are learning about where food comes from. However, they are definitely an added expense, not a cost savings. I recommend them nonetheless! Jacob has written a book now about the system he used to retire early which is completely repeatable. He basically saved 80%ish of his take home pay for 5 years and kept cutting expenses to the bone. The site has a lot of great reader content through the comments and forums too. The site is still fairly mood and the writer has a lot more of a Ramit style tone to his writing but there are a ton of great posts already up and they just started a forum that is blowing up. Both sites boil down to spending far less than you earn and saving as much of your take home pay as possible. Sell the, “stuff,” you don’t need and are paying to store, downsize what you can (cars, house, cell phone bills, gym memberships, don’t eat out, etc. ), and invest like crazy in index funds, rental properties, etc. Go dig around. Both of these sites are highly focused on achieving FI/early retirement so they cover more of the later stages of PF that a lot of other PF sites don’t hit on. Not to begrudge JD at all, however, I wonder since he has sold GRS is he at liberty to mention other websites. Corporations often have very short-sighted unbalanced perspectives – if traffic is directed to another site, then maybe people will abandon GRS? Nothing could be farther from the truth, good content includes references to other websites who may fill another niche. These sites don’t exclusively focus on a step-by-step guide to early retirement, but how to build wealth. The third personal stage of PF is definitely more nuanced -paying off consumer debt is a gimmie in Stage One. Fee-Only Financial Planners should be a apart of the equation -I think the wealthy value professional help. Keep in mind the ERE model really does focus on what JD touched on with the whole crossover point and reaching financial freedom when your passive income exceeds your expenses. The guy there just did it by earning a pretty good salary combined with extreme minimalism with respect to his life and expenses until he had about $300-400K in investments and then found a way to live on the income from those investments (if I recall it was something like $10K or less a year). At that point he “retired” from being dependant on a full time job with passive income (though passive is questionable since smart investing isn’t necessarily passive) meeting his expenses and quit working for a salary for a while. In essence this no different than working many years, saving a nest egg, and than living off it. He accomplished this quicker by extreme expense minimalization. One of my favorite topics. I am pursuing a self-sustainable retirement. Rather than save a pot of money and hope that it will be enough to live in 30 years, why not use it now to buy the things you will need? When you save up $20,000, buy some land. When you have another $100,000, build a small but efficient house. When you have another $25,000, add solar. And on and on. Once you’ve got everything in place, you can semi-retire early. If you wait until you are old and retired to spend, everything is just going to cost more. What’s the point in dying with a half million in a bank account? 1. have two good incomes by studying and working hard, but live on one. 3. build a portfolio of investments suitable for your situation and personality, in the end we decided on a dividend based portfolio of shares. Well diversified over different currencies and sectors. 5. actively enjoy the freedom retirement brings. I have started trading antiques, started work on the controlling board of a company, followed courses, spend a lot of time with my kids, help them with their school work, did lots of volunteering, studied local history, did lots of work on the house (and made it very energy-efficient which saves lots of money), worked on the garden, travelled etc. All things which I like and could not have done while working. My wife started a company because that was her dream. And it is doing very well. I’m 26 and have recently become fascinated by investing, financial instruments, etc. I know that not everyone has the luxury(?) of becoming enthralled by things like cumulative versus non-cumulative preferred stocks, but just reading investing articles and magazines can sure help a lot. While picking individual stocks or bonds is likely too risky for the individual investor, knowing what to look for in an investment is better than blindly throwing money into an index fund, and “hoping something good happens.” It’s good to be able to say that you want high-yielding stocks, or municipal bonds, or low P/E stocks, or international stocks, etc. I plan on retiring early by not just frugal living but by buying high-yielding stocks of big, established companies that likely won’t go out of business, and that will likely keep raising their dividend. It will take years, but some research, some sweat, and some Tums will hopefully let me retire much earlier than the others in my field. I won’t bore you with the formula (see links below), but for YOUR specific situation: you are currently saving ~15% of your combined TOTAL income, which will require ~43 years to reach financial independence. I’m assuming you want to do it in 20 years (by age 60), which means you need to shift your savings rate to ~45%. How you make this shift is up to you. Either save more or make more (as they said in the post). BUT, most people find that it’s easier to live on much less than they currently do, without sacrificing. You just have to start doing more work in certain areas yourself. If you can reconfigure certain things about your life to live more frugally (e.g. downsize expenses, drop one of your two cars… many other options…) this rate is easily reachable. mrmoneymustache.com is great, as is earlyretirementextreme.com . p.p.s. GetRichSlowly guys… You should DEFINITELY check these blogs out, possibly for some guest posts. I generally avoid getrichslowly nowadays, but I read every mustache post. Getrichslowly helped me take control of my finances… but these guys are helping me use that knowledge to actually take control of my entire financial paradigm. I think another key component to retiring early is having a small family. My husband and I made the conscious decision to have a 3rd child, knowing it would delay our retirement. Also, you need to be maxing out your Roth IRAs and 401Ks. After that, invest in low fee mutual funds with a company like Vanguard. When planning your financial goals I think it is legitimate to find out the effect of children on those goals. My point is that folks should make an informed choice based on their own values and circumstances, but whatever you decide, having an idea of the financial implications is helpful. We recently had our 2nd child (our last!) and this month we start having $2000 in childcare costs for the two kids. Now this isn’t permanent since they will be going to public schools, but it’s a bit of a shock to start paying $24k per year in child care costs. I started reading the book Your Money or Your Life several weeks ago. It is a great book and agree that anyone who wants to retire early should read it. I had checked the book out of the library. And just yesterday ordered a used copy for 75 cents because I want to use the book as a guide when I start taking the steps suggested in it. Invest in your career and earn the most you can. Cost cut big expenses…don’t buy a fancy car, big house, refinance, shop around for car/home incurance, etc. Clipping coupons will get you no where. In 20 years, you’ll have saved enough to retire without having to touch your retirement accounts (IRA, 401k)…this is my goal as well, and I’m currently on track to do so…. I’ve been financially independent and early-retired for almost a decade. It’s a challenge to control your expenses and to save aggressively, but after a few years the magic of compounding begins to accelerate the process. That’s a powerful motivator. http://the-military-guide.com/2011/01/03/how-many-years-does-it-take-to-become-financially-independent-2/ Take a look at the tables in the post to figure out what it takes to accelerate your retirement. It’s easiest to cut your spending and boost your savings. After that I’d focus on raising your income. Education & career advancement are great, but many can start a side hustle in rental real estate or blogging or website work or freelance writing. When you truly value a goal of financial independence, then your spending falls into line with your values. It doesn’t feel like deprivation or slave labor… it feels like unlocking the cage door! In Canada, the TFSA (Roth equivalent) is $5000 a year (soon to be increased for inflation to $5500 I believe) that you can withdraw both the principal and the income tax free at any age. So if I retire before 59 or whatever the minimum age to collect CPP/RRSPs/Pensions without a penalty, I will take money out of my TFSA until that age. The TFSA funds early retirement while the main retirement accounts fund my “normal” retirement after 60. That’s my plan anyway. Right now I fund 20.5% of gross pay into main retirement and the max $5000 a year into my TFSA. Hopefully I’ll be able to quit working in my early 50s. I wonder about the financial independence thing a lot. I have determined it is about as simple as you have made it out to be. That said it still isn’t easy. Saving as much money as you can towards he goal is the biggest piece of the puzzle. The way to do that is earn more and spend less. There are many ways to do both of those things and the particular method for everybody will differ, while the blueprint stays the same. We are at the “Work Less, Live More” stage, and that is a terrific book, too. My husband got the opportunity at 56 for an early retirement deal from his corporate job. This happened just as our last son graduated high school, so kids are grown. I’m self-employed in an online service business, and also have income from a greeting card network marketing business. We took several months to get rid of 2/3 of our stuff, sell the house, and move to where we knew we wanted to live in retirement, where we had a rental condo. We paid that off with the severance and some savings. Between having the kids grown and a paid off house,those were the two biggest factors in being able to change our lives. Retirement isn’t really a very useful word anymore, but it’s a wonderful change of pace and priorities. Initially we assumed he’d go into another corporate 9-5 gig, but once he was free of that, he just really didn’t want to, and I’m in full support. We have my self-employment income, and he’s going to work part-time locally (we’re on an island of about 2,000 folks) at something he enjoys, and have time to pursue hobbies, new friendships, and work on community issues where he can help. I’m also starting to develop some additional income with affiliate marketing online, so ideally we won’t need to dip into the 401K for many years. My goal is to replace the income from my online service business, since it doesn’t allow me to take weeks off at a time, which is an important goal for travel plans. We have an HSA for health insurance, and small businesses in WA can get the same rates as large companies. I don’t know what other states have that law. Scaling down lifestyle to what is truly enjoyable and necessary takes a lot of communication if you’re married, but it definitely makes it possible to leave the full-time work force earlier than you might think. Mix that with part-time work and/or develop passive income online to stretch your savings. I have to say I agree – while I haven’t quadrupled my income – I have also spent zero hours marketing and selling myself (other than Linked-in kind of marketing). I didn’t set out to become a freelancer – but one day at my “regular” job there was a client who had a project with a budget too small for us to take on. The client happened to be in my hometown so I said, I’ll help you out and do this on the side. Immediate 5k raise. That client told a colleague of theirs and so forth, and in 2012 I have about 17k worth of contracts pending. As I’ve gotten more work I’ve become more structured with contracts and invoices than I was for that first project. Right now I’m trying to balance the prospect of accepting another contract, and if there are enough hours in the week to do that while working full time. You have to put in some nights and weekends. But as I work in education/academia – I earn a slightly better than mediocre income (with great benefits though)with occasional small raises and little chance of making it rich – so this extra money is going DIRECTLY into funding my Roth IRA (while saving a chunk of it for taxes) & saving for a down payment. I’m in the same position as Charlotte… My husband is 30 and I’m 28. We’ve covered the basics, are living on one income while we pay off the mortgage, and now are wondering what will come next. While I don’t have any advice for her, as we’re asking the same questions now, this article is spot on for me and I just wanted to say thanks for posting. My plan has me financially independent in 10 or so years, by age 48. A lot of this has to do with owning my own business and the longterm value that creates. Assuming I don’t run it into the ground, I should be able to sell or hire someone to run it. Once I turn 48 my kids will be in college (or out of the house) and we plan on living a very simple travelling life in the US, Central America and SE Asia. With a lower cost of living, no house (for awhile), and no need to continue saving for “retirement,” my cash flow will be massively freed up. 1) I feel like I’m sacrificing very little to achieve this. We travel a lot now and plan to do an RTW trip next year with our kids. That’s only possible because steadily increasing income + modest lifestyle inflation. Never leave a dime of employer retirement match on the table. Sometimes that means not changing jobs until you’re fully vested. Other times that means cutting back on debt repayment so you can fund a 401(k). Leave your investments alone. I’ve read that over 25 years the stock market averages 8% but the average investor makes only 3% (or something like that). Why? Because they buy at the top and sell at the bottom. Pick a strategy and go with it. Don’t let emotion ruin your returns. Don’t get divorced. Halves both income and savings. Pay extra on your mortgage so that it’s paid off by the time you want to retire. Don’t have kids! In addition to the money it costs to get them to 18, they tend to hit college age at the time you might otherwise want to retire. My parents retired in their early 50s and still paid for all 3 of us kids to attend top colleges + law school/medical school. They are proof that kids are not a deterrent to early retirement if you are smart and driven. We all hope to follow their example & I can’t imagine sacrificing having children solely for the pursuit of wealth. If anything, my husband and I have become more successful since having a baby because nothing is more motivating than wanting to provide our baby opportunities to succeed and be happy. If your parents retired in their early 50’s and paid for all that, then they could have retired in their early-or-mid 40’s if they hadn’t paid for all that. Having kids is a very, very expensive lifestyle choice. Of course, if that’s the choice that the happy couple wants to make it’s up to them, but they should go in knowing what they’re getting into. That’s true but now they’ve got kids to check them into an assisted living facility (joking). Great post. I’m not working and don’t need to. good luck to you, just trying puts you ahead! “-live off 1 income even while earning 2” is great advise…. Why the assumption that socking away a small percentage of your income each month into a retirement account, usually a stock investment account, will somehow get you where you need to be. Many times it won’t. Thats the problem. There are other investments other than stocks and mutual funds. There are other ways to retire other than funding retirement account. Lets use GRS as an example. JD is in semi retirement. He didn’t get there by retirement accounts or saving money each month for 40 years. He didn’t get there slowly either. He got there by building a business and then selling it. How do rich people get rich. Few do it by investing in retirement plans. Few do it by investing in the market. Most all do it by investing in a business. Not a stock of a business, but a real business. A business that creates cash flow. That creates an asset. Figure this out, and you are ahead of 99% of the rest of the people who think 59 & 1/2 is the magic number. Not everyone is the type to start a business. I know I don’t have the entreprenurial skills to do that. I am the typical person who saved a % of my income each year for retirement. From age 22 until age 34, I maxed out my 401(k) (got a co. match) and my IRA. At age 22 my income was $20.5K. At age 34 it was $60K. I then stopped working to stay home with children. I still contribute $5K to a Roth each year. I am now 44 years old, and I currently have $250K in retirement savings. I obviously would have a lot more if I had not stopped working. Starting investing early and taking advantage of compounding of money is actually a great way to get where you need to be in retirement. I feel the same way…. But then I wonder, maybe that just means that everyone isn’t the type to be rich. If you are pursuing a career that you love, you are definitely going somewhere, no matter how much or how little you make. They did not mention an absolutely vital detail– what plans, if any, do they have with regards to children? It will obviously be far easier to retire early if kids aren’t in the mix, both because of enhanced earning potential and reduced expenses. If they haven’t already discussed this, then they probably should. Yes, I agree with some comments already. 10% plus 17% will not get you where you want to go. a. Save a much larger percentage of your income. b. invest a large part of your savings. How you invest it is up to you. Some have mentioned businesses, or real estate, etc. You need to find things that you want to do and are comfortable with. Something I don’t see addressed when the subject of early retirement comes up is how do people plan for pay for care if they need it as they age. My mother always lived a very healthy lifestyle and was active into her eighties. Now at 88 she has Alzheimer’s Disease and is in an assisted living center. She has an excellent pension and enough savings to pay for her care for the rest of her life. I could retire in another year at age 55 and have a good life on the money I’ve saved, but even allowing for a modest rate of inflation, I wouldn’t have enough to live in the assisted living center where my mother currently is if I develop Alzheimer’s as well. I’d love to hear people’s plan for dealing with their old age. Am I missing something? I for one am not going to sacrifice one second of quality, healthy time of living so I can be prepared to pay a facility that will house me so I can not live, but exist, at 88 with alzheimers. So, just curious: What will you do if you’re 88 with Alzheimer’s? It’s not like people can always choose what will happen to them as they age. My mom had MS and it was very tough for my parents financially towards the end. But if they hadn’t lived frugally long before she became really ill, their options would have been much more limited. My advice: Don’t assume it can’t happen to you. I’m sorry your mom went through that as I am equally sorry to hear about @Sofie’s mom. No matter how much effort any of us put into living a healthy life, nothing is guaranteed. It’s a personal choice but I choose quality over quantity of life and thus won’t sacrifice a full life today so I can be prepared to pay someone in my old age to change my diaper and tell me my name. I’d rather be reunited with family in heaven if it comes to that. John, you didn’t answer the question. What would you do? Kill yourself? Rely on whatever public safety net remains at that point? Rely on your children/family? Starve in the street? I appreciate not wanting to sacrifice now. But sticking your head in the sand doesn’t help either. Thought stating my preference of reuniting with loved ones in heaven was a nice way of saying it but yes, I’d end it peacefully. I’ve spent enough time in nursing homes to know without a doubt that’s not going to be me, and to sacrifice living now on top of it?Not a chance. We are more humane to our pets. It’s naive to think that you’ll have that option. Dementia sneaks up on you and things like strokes come out of nowhere, leaving you incapable of taking your own life. And nursing home staff are VERY vigilant about this, too. A realist who has worked in a nursing home. Naive? Thanks @Sarah, the world is a better place with all knowing people such as yourself in it but your experince is not the same as mine. However, if something tragic occurs and I am incapacitated, then society can pay for housing me until I die if “they” are hung up on equating breathing with living because I am not. If you choose to give up hiking our National Parks, seeing the wonders of the world, snorkeling in the Caribbean or anything else you may want to experience so you can afford the best keep me breathing facility that is your choice to make. John, I don’t know why your comment is so angry. I haven’t given up “hiking our national parks” or anything else. I don’t have a stance on long term care insurance. I’m just saying if you think suicide will solve your aging-related problems, you’re not being realistic. The government won’t pay for your care until you’re bankrupt. So it’s more a matter of, if something happens to you, are you okay with your spouse having to “spend down” all of their assets and become bankrupt for your care? Personally, I don’t have an answer to that, but I think oversimplifying it is not helpful. I am with John on this one, I think you should have the right to end your life, just like you have the right to liberty and the pursue of happiness. You don’t have the choice to be born into this world, so at lease you should have the right when to exit this life, without breaking any laws, or asking for permission from your wife or family. It is a personal choice that should be honor, by society in the event that you are not able to carry it out yourself. I wonder if the ideal situation would be to “retire” or reach financial independence sooner rather than later and then continue to work and save? “old age” is about forty years off for me so a whole lot is going to change in the meantime. I think all we can do is prepare as best we can. We don’t know when or if our bodies or minds will start to fail, and we can’t predict if there will be another World War or depression either. I do not know the ins and outs, but my 60 year old in-laws have invested in long term care insurance. @Sofie: Try Googling “Advance Care Planning”. (Awareness day is coming up April 12, I think.) Experts are trying to get people to think about these issues and start planning for them. @John: have you considered drawing up a living will? (Now, when there’s no question that you’re of sound mind.) Sometimes family members and doctors don’t know where to draw the line when it comes to “heroic measures” because people haven’t planned ahead for their future. After Alzheimer’s/dementia becomes detectable, it’s often too late for people to have any say in their own future. They should create passive income. Real estate investment is one way to reach their goal. Strange as it may sound, be careful relying significantly on a retirement account to fund your retirement. This is the most highly visible and highly regulated type of savings in the world. As the federal government’s financial situation deteriorates in the coming years, expect taxes to rise significantly & the rules of the game to change dramatically. They will be shaking us down for any money they can get, and retirement accounts will have a big target on them. This post came at the perfect time for me, as I just finished reading Your Money or Your Life. I’m excited about implementing the plan laid out by the authors. I think I’ll check out “Work Less, Live More” next. Dang this an inspirational blog….I wish I was thinking this way when I was their age. My first thought, as mentioned in the post, is to diversify income streams and save more now. If one wants to retire early, is it best to max out the 401k or is it wiser to take some of that money and invest it in taxible accounts that will provide the income/priciple during early retirement? Let’s assume it is a given that either way, a Roth IRA is maxed out. Please let me know if you get any insight into this! The good news is that this is a math problem that can be solved. The bad news is that it may not be possible for everyone, or some may not be willing to make the necessary sacrifices. I don’t plan on not working in my 50s, but I do plan on being financially independent at that point. I think its good for me to be engaged in productive work and I value contributing to society in this way. My plan is simple and echoes what others have posted. I own my modest home outright. That lowers the expense line considerably. For me, the remaining (non-mortgage) expenses are about $2k/mo. My military retirement pay is about about $4k/mo. (Done, technically, at this point) Pensions are pretty scarce in the private sector, so this income could be replaced by a small business that doesn’t require your daily presence. I am also using my income to purchase (with cash) rental properties in the area. Without financing the properties, the monthly cash-flow position is more heavily positive and allows for hiccups and short-term vacancies without ruin. Lastly, traditional retirement vehicles (IRAs/401k) that I have contributed to over the years round out the mix. I have also considered an immediate annuity (gasp) if I required the extra income in my latter years. The key components for me is to save as much as you can, and not allow your lifestyle to inflate with your income. We are comfortable, but save about 40-50% of our income. That’s a decent shovel for any financial task. Don’t let the government limits on IRAs/401ks and the like become a financial anchor in deciding how much you need to save to reach your goals. Those limits are arbitrary at worse or decided based on government tax interests, not based on how much you need to save for YOUR retirement goals. You can max out the retirement savings, and save more in a taxable account. For some goals, it might make more sense to never put that money in a tax deferred/free account to begin with. The next component would be own your own home. This is not an “investment” in the traditional sense. You will never pay off your house if you are always comparing the carrying the mortgage with the long-term returns of the stock market. Rather, you are paying it off for the security of eliminating a major portion of your expenses and push your monthly expense curve lower. The last component is “multiple streams of income”. Whether it’s social security, a side business, rental income, stock dividends, or bond interest, in the aggregate, they have to be considerably MORE (because they each fluctuate) than you require. Multiple sources will be diversify your income and allow you to be able to weather the inherent ups and downs. My thoughts. Best wishes on your journey to financial independence. I achieved financial independence when I was 38 years old. I achieved it investing in rental property. This may not be for everyone, but I reached my goal in a relatively short time. Im ahead of the curve in many ways, I make a little over 6 figures a year and my only debt is a $25K student loan (MBA) and my mortgage which I just got 6 months ago… I live in the SE USA. Im 27. Retirement.. hm, Im not sure Im interested even at 60, retirement ages you… I do look forward to making enough money to do whatever I want. I’m not saving much (maxed my 401k) and just bought my apartment (within my means). I’m pretty frugal.. but everything I have extra I have invested into a couple start-ups.. we will see what happens. We all have different goals in life. I have always hated the live frugally and save for retirement… I want to enjoy my life today and be smart enough to prepare so that I can enjoy my life tomorrow too. I’m 29. My goal is to retire by 35. I set this goal when i was 25. By retire, I mean, i want to have enough in the bank so that I don’t have to work again. How am I accomplishing this. 2) Increase My income. I work 3 jobs. I have a regular 9-5. Then I own 2 businesses. My husband has a 9-5 and he owns 1 business. I have built up my clientele and will be able to transition out of my 9-5 in a couple of months to focus more on my own businesses. 3) Pay off my debt, including credit cards, mortgage, car, and student loans. 4) I currently don’t invest or put money in a 401k. I don’t see the point when the finance charges on my mortgage and credit cards out weigh the returns. not to mention I can’t touch that money. I may not live to the standard retirement age. Once I have enough liquid capital, I will invest in other businesses to keep increasing my income. This is my standard goal but as life changes, my plans change also. For example, We have 2 kids. This means saving for college. I’d be interested to know if Charlotte would want to start her own business in the future. Maybe retiring from working for someone else in exchange for the freedom to be her own boss. I agree with those who say to buy rentals. It’s not always easy all the time, but we chose wisely and ours have appreciated greatly. Unlike you, we are not high-income so every few years we will sell one, skim a bit off the top for a home reno or a vacation, and then reinvest the rest into another rental. When we bought them (about 9 years ago) they were part of a global game plan. That plan included having a paid-off mortgage (done! ), and taking out a 12-year loan for our most expensive rental. So that rental will be paid off just before our last child leaves for college in four years, and the income will help pay for his college costs. Once he’s done with college, we plan to fully retire. This said, there is another component: find something you love, and plan to do it for longer, even PT. Look at things holistically, decide what is important to you, and work towards that goal. Is it more money? Travel? A shorter commute? Only you know. The better financial position you are in, the more options you have. Three years ago I was in a dead-end job/career and all I could think of was when I could retire. Suddenly my company moved, but since they were not doing well, they were looking to reduce staff, so they offered employees who lived a certain distance away a fabulous severance package. We had just paid off our mortgage, so I jumped at it. It took me a couple of years, but now I have another job/career that I LOVE. I plan to continue doing this job for longer than I ever planned to do my old job. What’s the best way for Charlotte to reach financial independence? It should be the same way I have for myself. 1. Increase income – Could achieve independence quickly. Harder to implement because of many external factors. 2. Reducing expenses – Should take more time and easier to do as external factors are not playing role. Its only about you. Charlotte, if possible, mostly it would, go for both! When it comes to owning a business, it is a tricky thing. But if you play it right it can really pay off. My thoughts are that it is best to work on a business that is paid a little from a LOT of customers – as opposed to a business that takes a lOT from a few customers. In the first scenario, you have more people supporting you and if you lose a customer or even a dozen, it doesn’t really impact your bottom line as much. But if you make 1000s or 100s per month off 15 people, losing even one of them can be hard on your business. An actual analysis would require a few more facts; of particular importance is the couple’s current net worth. Unfortunately, this article just re-hashes general principles taken from other authors (without the addition of any value), after which we, as readers, are asked to fill in the void of information. I’m 28 and often wonder about the same things. I live frugally, put 20% of my income in a 401K and save even more. When I was 26 I quit my job and spent 6 months motorcycling through Central and South America. What an awesome journey! It cost me about $15K (plus the wages I could have been making if I had been working). I want to travel more and don’t want to wait until I retire. I live frugally so I can enjoy life in the manner I see fit. I continue to fund my 401K and the rest of my savings goes towards “adventures”. Financially, it would be better to use that extra savings to buy a house (I rent now) or allow myself the financial freedom (time) to build a business. However, for the moment, I’m quite content with working, saving and adventuring. I don’t have kids but I’d like to some day. I’m trying to be smart about planning for retirement and hope that my youthful adventures will continue as I move forward in life. Am I crazy for thinking this way? Ben, absolutely not crazy. You sound like you have a level head on your shoulders. Wonderful that you had that 6-month adventure now – you may never again have the energy, time or lack of responsibilities to do something like what you did. And very reasonable to want to enjoy life now rather than wait until retirement. 1) No rush on buying a house if you’re single and don’t know what the future may bring. Just try to keep your current living expenses as low as comfortably possible and sock away some money for a down payment whenever the right situation comes. Buying a house should be a long-term commitment – as a single person, you may not want to lock yourself into a 5-10 year decision. 2) Funding your 401k is a fine option; depending on your tax bracket and employer match rules, you may want to do a Roth IRA with some of your retirement money if you qualify and aren’t already. Not crazy at all :) Some experts I’ve talked to think that in the future more people will delay retirement so they can enjoy time off during their career. For instance, take a sabbatical to travel or take time off to stay home with kids. The idea that you work and sacrifice until some golden age called “retirement” is rapidly changing. There’s no one right path for everyone. Some people want to work their butts off now to achieve freedom to do what they want later, and some people will delay future freedom to do things they want now. It depends on what makes sense for you — and being mindful that you know what you’re giving up in either case. If I were you I would just read up as much as you could on retirement, saving, investing, from different sources, just make sure they’re reliable. Someone who has paid off their mortgage, paid off their credit cards, and loans, lives within their means, and lives in an affordable area, will have a much easier and fun retirement than someone who hasn’t done that by their retirement. Even if your portfolio is $500,000-1,000,000. You’ll live like a queen compared to someone with debt, mortgage, etc. That’s considered to be a low portfolio. Then again “low” is relative to where you live. In Nebraska where I live that’s decent and you could live pretty well, if you live in San Francisco or NYC that would be nothing there. You need to save more than 10% because these days 10% is nothing and IMO is outdated 20th century advice. These days you need to at least save 20% or more. IMO its better to save 30-35% or more. of debt, am starting an emergency fund, and once that is done I’m starting to invest for retirement. My goal is to max out my retirement funds each year. I suggest you get Dave Ramsey’s “Financial Peace Revisited” book, a lot of people like to take his Financial Peace University class that is offered at churches and even online. IMO that class is overpriced. If you read his “Total Money Makeover” and “Financial Peace Revisited” those two books are pretty much what is covered in the Financial Peace University. The books did help tremendously, even if you’re not a Christian, which I’m not, they will help, there’s a lot to be learned from his books. He also writes what kind of insurance to get as you age so that you don’t end up draining your savings. This is the time to get serious about saving for the future. And at some point ask yourself what do you consider “enough” – I’m serious. People will win the lottery, will get nice inheritances and windfalls that are in the millions and still spend it all. Ask yourself what matters to you and how much is enough for you. In Economics they say “people have infinite wants and desires” and yes I agree with that, but seeing as to how most of us aren’t Bill Gates we have to spend consciously. Maybe you love horses, so you buy a plot of land and 3 horses. But you opt to live in a smaller home. Whatever it is just realize that in life there are trade-offs to everything you do. Trade offs in time and in money, people don’t like to think that trade offs exist but they do and its much better to acknowledge and deal with it than to bury our heads in the sand about it. Don’t let the fear mongers scare you about retirement. Yes it seems daunting at first, but the way to get past the fear is to get educated. Knowledge is freedom. This is a good topic to discuss. For myself and husband we both don’t look forward to retire…but because we enjoy building and running our family business so much, our goals are to build stable business empire and really hope to transfer to our children to continue being successful empire and do good for them. We are pretty frugal and live simple life style. Saving with making a decent income are important to be able to support your life style in the future, and do investment….in term of as typical investments (stock market or others) and start up and build businesses can make you have a good life future you want to. I agree with maxing out the Roth because you can withdraw your contributions penalty-free at any time. I hate to say it, but as someone around the same age (early 30s), early retirement is a very ambitious goal in this environment. Two key things will help: 1) finding jobs where you and your spouse make as much money as possible; and 2) living a frugal lifestyle in which you cut expenses. I don’t know how much you make, but you probably want to max out both of your 401ks at $17,000 each if you can, on top of $5,000 each in the Roths. The reader mentioned 401ks, which leads me to believe neither partner is a public employee who might be able to retire with guaranteed health benefits. But for us private-sector workers, absent some kind of health care benefit that serves as a bridge to Medicare, you will have to save all the much more to pay for your health insurance if you retire early. Let’s hope medical inflation doesn’t continue on its current trajectory, or else our costs at that age will be enormous. Beyond that, I think you will want to own your house outright by retirement. None of us can predict rates of return, tax laws, tax rates or entitlement offerings over the next two to three decades. All you can do is squirrel as much away as possible, learn to live with less and hope for the best. Because we can’t predict these things, my personal approach is not to set an age goal, but to save as much as possible while still living a happy life in the moment now without relying on consumer debt. We own 2 rental properties so I’m familiar with real estate as passive income but I would also like to see more posts on passive income ideas. The truth is that retiring early on a completely passive income requires the accumulation of a boatload of money. The better option is to invest in education and business opportunities that place you in a position of flexibility while requiring only part of your time for maintenance of the business. You get the best of both worlds–a flexible schedule and a dependable income flow. It amazes me how many financial professionals don’t tell people about real estate investing. To them investing is only financial instruments and therefore how can it claim to be balanced? I own 7 rental properties, 1 office building and my personal home. My personal home is paid off, and so are two of my investment properties. I am on course to have them all fully paid off in next 7 years and they generate over 70k a year in passive income. I plan on retiring early at 55 with 10 income producing properties generating over 100k per year. And yes, I fully fund two 401k plans and my wife is fully funding hers too. Real estate can help you fill that gap, provide an annuity stream and still give you a hard asset to sell at some future point and should be part of a balanced plan! We appear to have done everything right. We’ve maxed our retirement savings since our 20s. Paid the house off that hubby built in 7 years, no debt of any kind and no kids.We save about 50% of our income and more. But look at costs in retirement–healthcare and taxes and you’ll see, it’s a dream that few will reach even if you do everything right. Do you live somewhere expensive? Can you move to a more affordable city and neighborhood? What kind of careers did you have? I’m back in college in my late twenties and I’m thinking of majoring in finance or becoming an entrepreneur or Physician’s Assistant. I’m scared to make anything less than $80,000. I really am, I don’t know how my generation, generation Y or the millennial’s are supposed to make it unless we go into high earning careers. BTW try to get disability, long-term care and umbrella insurance. Dave Ramsey says that when you get older you really need to get disability and long-term insurance. Other PF experts recommend umbrella insurance. Just try to get yourself insured especially as you age. I know its not fun but it’ll help you and your husband from draining your savings and investments. Buy early, buy forever (or longest term). This goes for houses, cars, furniture, clothing, electronics. America’s recent foray in producing and consuming throw-away products, or throw-away quality products, and the need to consume new technology like food, will leave the upcoming retiring generations looking at their assets and thinking “I’ve worked my whole life yet I have nothing to show for it.” Some may find upon further reflection that their money has gone to a lifetime of replacement products. Personally I didn’t save money as early as I should have, but I am still young (27) and I’m working on that. I did buy my house at 25 and bought my first car outright, financed my current car for only a few months before paying it off and I plan on keeping it for at least 10 years. I bought sturdy, timeless QUALITY furniture at garage and thrift sales. Furniture that can be easily refinished or painted if ever I want a change, chairs that were made to be reupholstered etc. This is how my grandparents and many older people I know have lived their lives and talking to them there wasn’t this anxiety about retirement and not having enough like there is today (even before the economy crashed. My parents did this, my mom retired in her late 50s and my dad in his 60s. My mom taught me to buy quality items on sale, and my dad is even more frugal than mom. What also helped me is to keep track of my spending. That’s easy now especially with online banking. I think we have more sales in the 21st century than our grandparents and parents did when they were growing up. You can only retire early if you start doing what you love and getting paid for it, or you accumulate enough wealth by doing what you don’t necessarily like. The first one is going to be tough in the short-term, but if you persist, it will prove to be the easier path in the long run.However, it is important that what you love doing is demanded by the market – otherwise you won’t get paid. My wife and I retired 3 years ago at age 56. Here’s what we did: Had children early, then quit having them. We were empty-nesters by age 40. We saved a very high percentage of our earnings, at least 50% . When we earned 2 incomes, which was much of the time, we lived on one income and saved the other. We bought a modest house and paid off the mortgage by age 36. We were totally debt-free at age 36 and stayed that way. We put some money into tax-deferred retirement accounts, but most of our money went into CD’s, T-bills, and annuities. My wife was able to take her defined-benefit retirement (teacher) at age 56, this included a health insurance benefit. We chose the high deductible plan which costs us only $140 per month. We banked the deductible before we retired and set aside money each month to add to that account. In retirement, we live on less than we earn in interest and retirement benefit, so we are still saving. We have IRA’s, Social Security, and another small pension we have not yet tapped that will help compensate for inflation down the road, along with the money we are adding to savings in retirement. By the way, we did this on average earnings. Our average income was a little less the median income for a two-income family during those years. The journey to financial independence was never boring. We’ve always enjoyed our life together and retirement just gives us more time to do those things which we enjoy. This post gives me hope. Both of you were very smart with your finances it seems. I think a lot of people think that sitting down and having a plan is boring and unless you enjoy that personally it is boring, but having a plan is what makes life secure and enjoyable and lets you do the fun stuff. Though not all low income earners like their jobs, if one has chosen this path deliberately, it is likely they chose it because it is personally fulfilling. Owning a business truly is tough, especially considering how competitive the markets are becoming. My advice would be to keep putting some income on the side and investing it in assets that are considered to be yielding a decent amount either in dividends or capital gains and just forget about them till the day you decide to pull everything out. I believe that’s what they call value investment or the buffet way of building wealth.